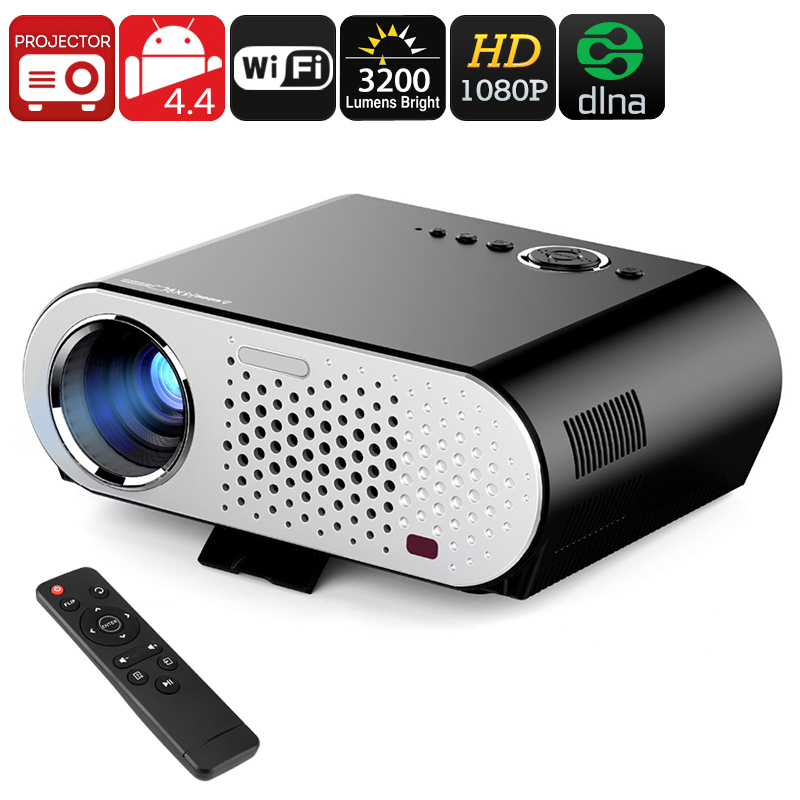 Successfully Added GP90 GP HD Projector - Android, Wi-Fi, DLNA, Airplay, Miracast, HD Resolution, 1080P Support, 3200 Lumen, 40 To 280 Inch Image to your Shopping Cart. The GP90 GP projector with 3200 lumens creates a movie theater atmosphere in your home. Even a large screen TV can't compete with this projector that brings a 280-inch projection for larger than life movies. With a brightness of 3200 lumens, you are sure to get a vivid display that is suitable for rooms small and large. Boasting 16.7 million colors and with a 3000 to 1 contrast ratio, your projections will have a rich pallet of lifelike colors. The projector has a 1280x800 native resolution and supports full HD 1080P content so will deliver a sharp and detailed image that is sure to impress. A large array of ports makes this HD projector compatible with both HDMI and VGA inputs as well as being equipped with RJ45, AV and USB inputs means you can display content from almost any source. The ability to connect this projector to your media players, setup boxes, BluRay players, games consoles, DVD players, USB memory drives or stream content directly from the web makes it one of the most versatile projectors available. With Wi-Fi, support you can enjoy wireless connectivity to your Smartphone, tablet PC or other devices and use DLNA, Miracast, or Airplay to stream and share content directly without having to worry about cables or wires. The GP90 GP projector is perhaps the best Android projector for those on a budget and with front, rear and ceiling projection modes it has lots of flexibility. The Android OS allows you to browse the internet and even download android applications so you can make use of Netflix, Hula or YouTube. A quad-core CPU clocked at 1.5GHz means you can use this projector as a computer, great for presentations or share your companies latest figures. With its highly efficient LED light source boasting a lifespan of 20,000 hours, this projector will last you many years before you need to change the lamp. This HD projector is the perfect way to put your entertainment on the big screen for all to enjoy and at an incredibly low price, it's a cheaper, compact and more versatile alternative to a big screen TV. This Android projector comes with 12 months warranty, brought to you by the leader in electronic devices as well as wholesale HD projectors and home theater gadgets.. This is the great LED projector we have so far, with it's built in android system, we no longer require laptop at times. We're using it in our church service right now and its versatility is really amazing!. Thank you for efficiently delivering the product!